I’ll start by saying, this is not an article – or at least not a complete one. 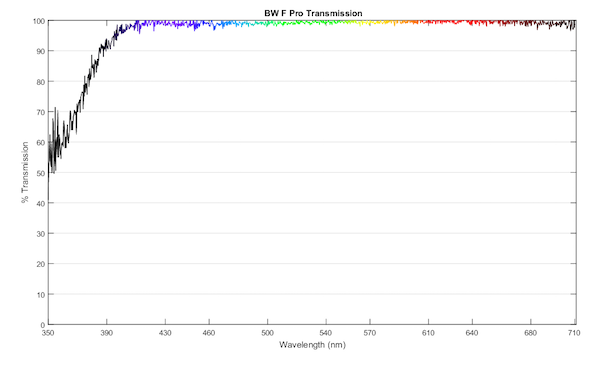 When I wrote My Not Quite Complete Protective Filter Article, I promised to try to add transmission spectrograms so that you could see not just the wavelength I tested for transmission, but also how the rest of the light wavelengths were transmitted. So this is just an addendum to that article. If you haven’t read that, then please don’t read this until you have. Mainly I was interested in how much difference there might be in the color cast of the various filters. I’m not numerically quantitating that here, but looking at the graphs, you can probably tell if one passes red light more easily than green or blue and therefore seems warmer, etc. I honestly could care less about how well any of these block UV light. 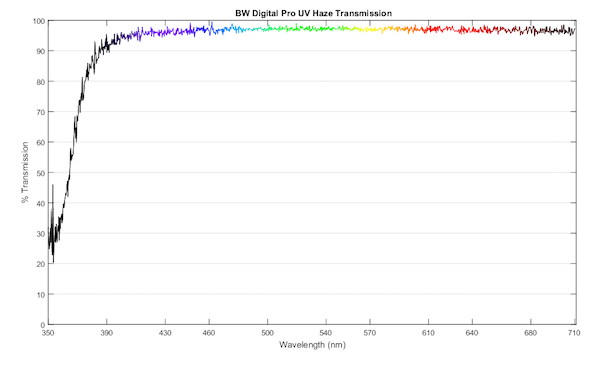 But many of these are called UV filters so it seemed like we should check the UV part, so I ran the spectra down into UV range so both of you who are interested in that can see it. 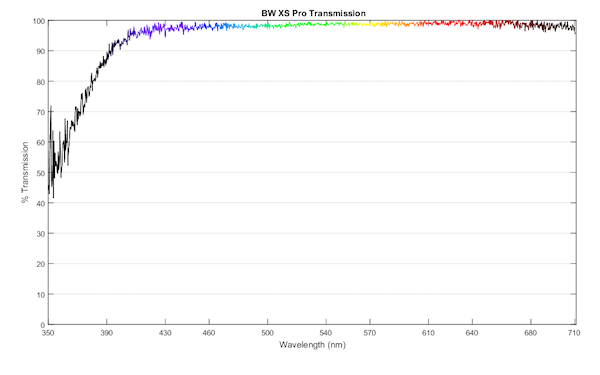 We very accurately measured transmission at a 635nm wavelength (red light) using a laser in the previous blog post. 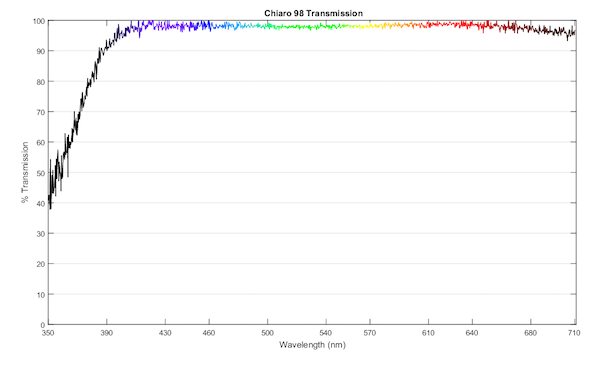 The spectrometer as we did this test is NOT as accurate for absolute transmission value, so don’t look at a graph and say “oh, well the spectrogram said it was 99.8%, and this looks like 97%.” If you do that we’ll know you can’t read and won’t take you seriously. Each spectrogram is quite accurate for relative color. So you can see that a given filter passes more light at certain wavelengths than others. You say filter X passes green light better and filter Y blocks more blue light. But you can’t say filter X passes 98.5% of green light, and filter Y passes 97.6%. This is all about the overall color cast of the filters and not about absolutes. So without further ado, here are the spectrograms. Oh, there is one ado. If you notice that a filter from the first article is missing from this article, you may assume that I broke it between then and now. Sometimes science requires sacrifice. Also, I’ve thrown in a couple of ceramic filters, brand not listed because they were loaned to me as a favor so that you can see the ceramic spectrum. 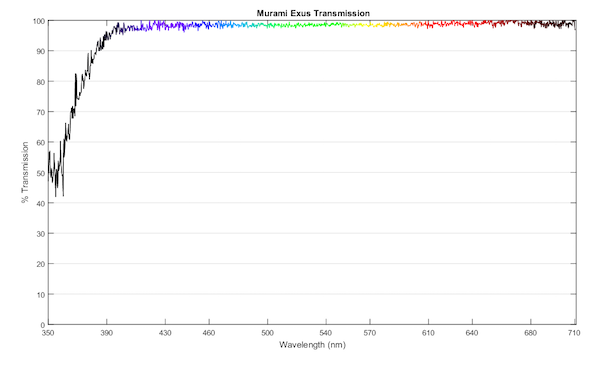 Oh, and to give credit where it’s due: Brandon designed the spectrometer using Thor-labs components that kept things somewhat affordable, Markus and Max wrote the software to make the pretty graphs, and Aaron and I did the testing. And made the blackout box, which was like having kindergarten flashbacks and making a cardboard-box fort. Not a lot. The amount of UV filtering that goes on seems really rather random in the non-UV filters. As does the wavelength at which they start UV filtering and how quickly it drops off. The Zeiss T*, for example just removes everything. Some of the others just kind of meander down to removing some of the UV, as do some of the ‘clear’ filters. Some get further into the UV spectrum before they filter, while others start just on the visible side of UV. Maybe this matters to some of you. Probably not. 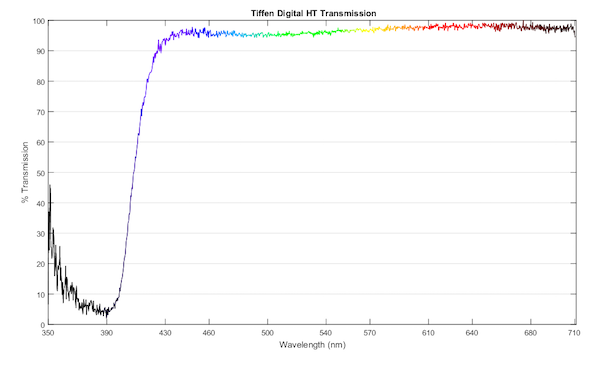 Most of the filters transmit a pretty flat spectrum in the visible range, although several, led by the Tiffen Digital, will have a distinctly warm cast. And in the very limited sample size we tested, ceramic filters might look cool, or not. So I guess we learned that same old lesson: white balance with your filter on, or shoot in raw, or both. What is best in life, Roger? To crush the marketing departments. See them driven before you. And to hear the lamentations of their sales reps.
Again, the above measures are valid as far as they go. I’d like to see measurements from 10 or even 20 filters marked the same…be that from Hoya or Tiffen or anybody. That will get to the root of manufacturing consistency. Until than, the above measure should be considered ‘artifacts’. It would help if you could look at the quality program of each maker, with an eye towards looking a the control chart of in-line measureables. I’d only be guessing as to the number of measureables and what they are. And as to control limits? And other process variables? >But reflection/transmission is “light angle dependable”. Yes that was also my question. 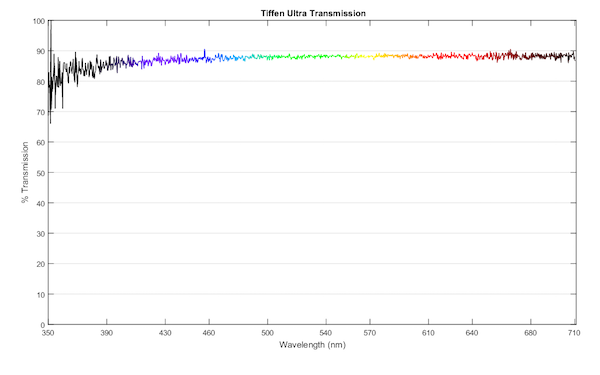 Also, modern lens and sensor already blocked the UV so a UV fillter is useless. The filter combo seems ok from review on uv forum. 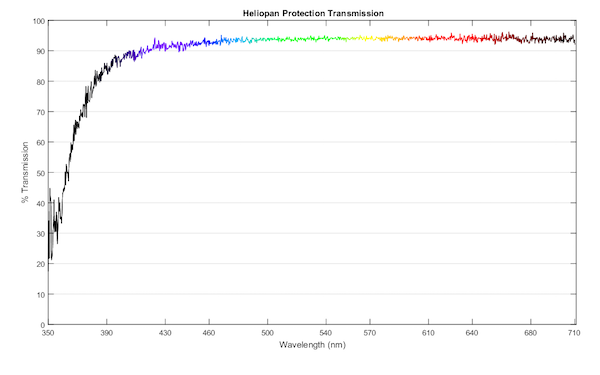 400-700 is considered visible light, though at 700 its getting pretty dark red. Dang, $387 for that filter. I need to get my e-beam system going so I can make my own filters. For some affordable uv lenses. I have a tmount 35mm f3.5 unknown lens, may be a Kuribayashi. Also have a m42 mount Steinheil 50mm F/2.8. My pentacon six Zeiss 80mm f 2.8 also seems to let a usable amount of UV, as does my Yus 135mm f2.8. I use a baader venus 48mm filter, so my peak is about 350nm. We use a color balancing filter with the source (you got the model # right) to even out the spectrum in VIS/UV, but it is still considerably weaker at e.g. 360nm than at 500nm. The loss of transmission from glass into the UV is relatively smooth/slow, a high Q/sharp cut will always be beacuse of coatings. 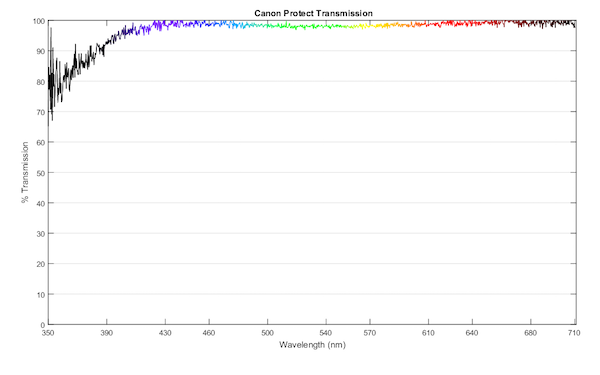 The Canon protect filter is pretty representative of normal glass for UV filtration. A glass model (e.g. 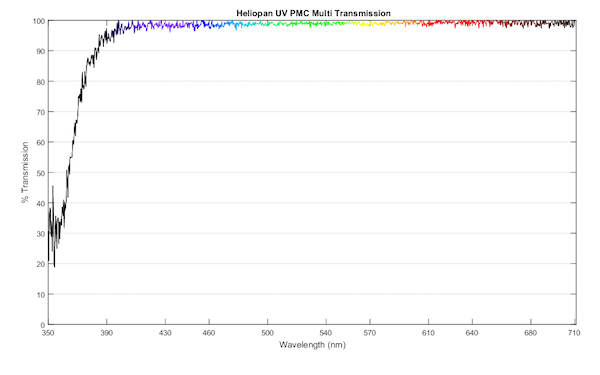 sellmeier) can predict the loss of transmission in UV from the (complex) refractive index as a function of wavelength. The imaginary component turns directly into the ‘a’ value for Beer’s law in propagation thru a medium. What lens are you using for UV? 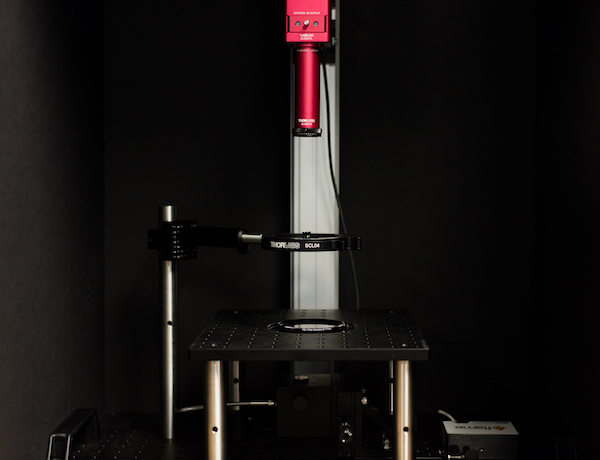 An enlarger lens? I had my 5DII modified with a quartz window in place of the IR-Cut so I can use it full spectrum and would like to try UV. I also have a Quantix cooled 6MP camera that has a bare CCD in a vacuum chamber with a quartz window that is sensitive to pretty deep in the UV that would be interesting to try. Haha. Roger uses the famous Schwarzenegger quote from “Conan the Barbarian (http://www.imdb.com/title/tt0082198/quotes)! Fun aside: What light source were you using? 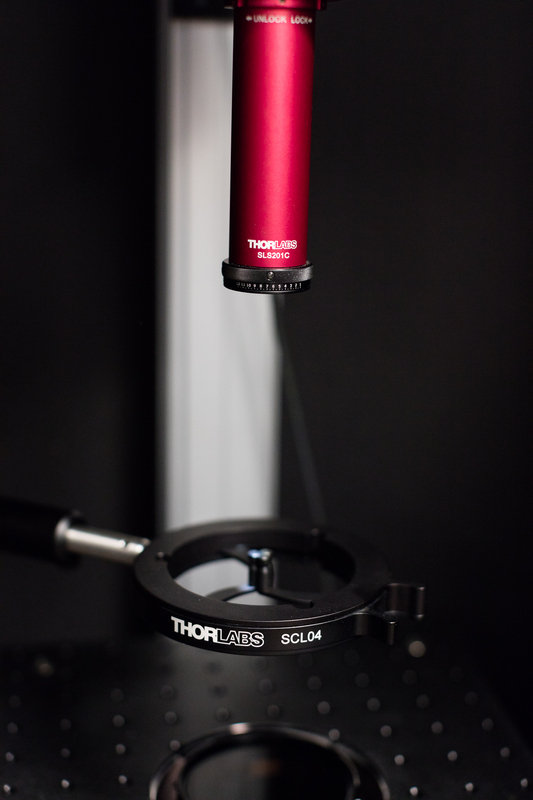 The Thorlabs SLS201L(/M)? 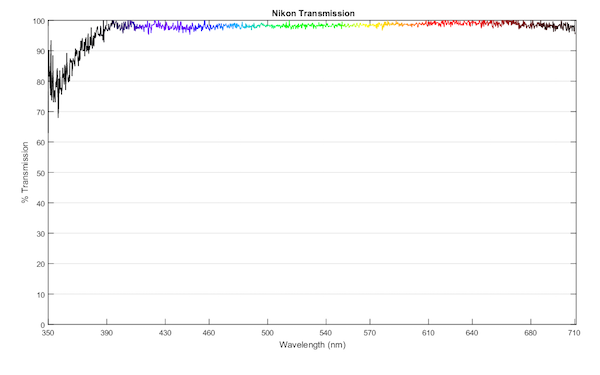 Its spectral power distribution tells me, that it gets a lot (I mean: A LOT) dimmer beyond 400nm which might explain the wiggles in your diagram: There’s just much more noise recorded by the spectrometer. 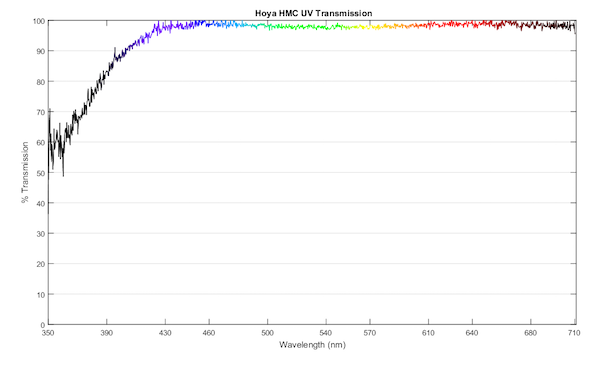 In fact, it is not necessarily (only) the coating that blocks UV radiation as you can see on the diagram of this page: http://www.rothkegel.com/transmissionkurven_versc_glaeser.html. Typically, UV-A/B/C doesn’t make it through ordinary window or float glass (http://www.glasludwig.de/Download/gl006.pdf), you would need quartz/fused silica glass for that (https://www.pgo-online.com/de/kurven/quarzglas_transmission.html), which is used in most of the UV-C irradiation lamps e. g. for desinfection (Osram Puritec, Philips TUV). If you want a steeper absorption edge, yeah, coatings come to the rescue. 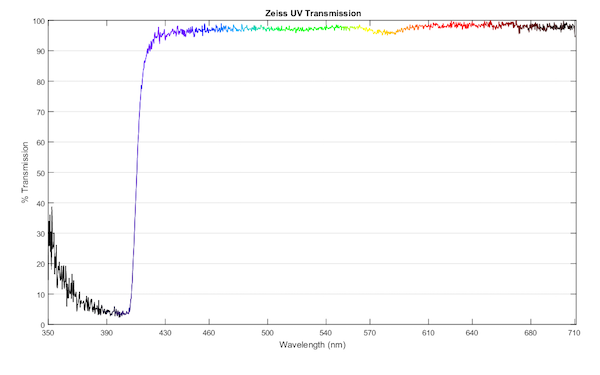 Fun fact: This is IIRC *NOT* the trick to avoid Ozone generation in UV-C lamps. Instead, they are doped with Amalgam to cut off the 185nm mercury emission line (http://www.osram.lampen-raum.de/media/files/pdfKataloge/OS_SP.pdf). 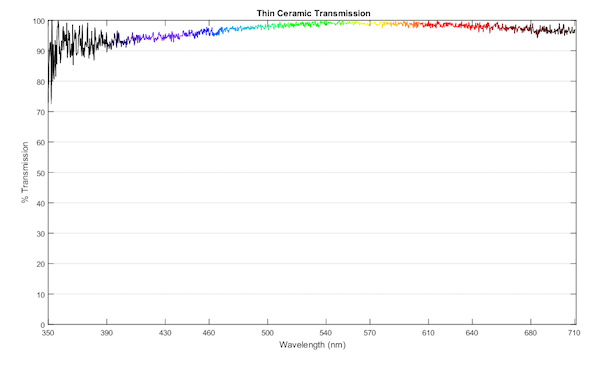 The curves you’re showing don’t convince me yet that the effect is necessarily due to a coating, even though there most likely is one to improve transmission in the visible spectrum. 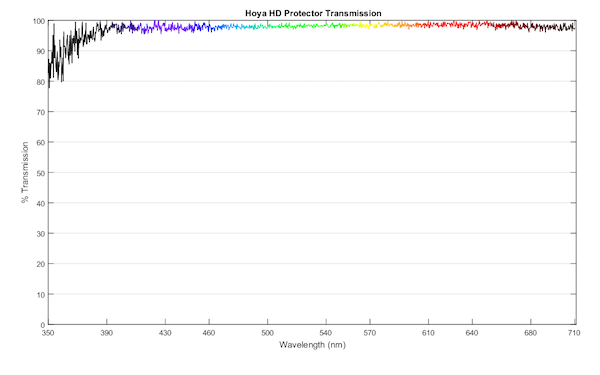 Look at what Hoya has to offer with their R72 IR filter: http://www.hoyafilter.com/hoya/products/specialeffectsfilters/r72infrared/. In principle one cannot separate absorptance from reflectance with a transmittance measurement. However, reflectance from an uncoated glass is around 8 to 10%. In regions where transmittance is relatively low (high absorptance) I think it is most likely that the predominant cause of low transmittance is absorption by the glass substrate, but I may be wrong. On the other hand there is no reason for using a glass that would absorb in the visible region. Not all filters are made equal, and for example some very old coloured filters for black and white photography where made as a sandwich of two clear optical glass disks with the actual coloured layer as “filling” absorbing at a certain range of wavelengths. Interference filters are in general more expensive to make, being some Baader filters a good example. Even if the coating is what attenuates UV, it does not need to do this via reflection. 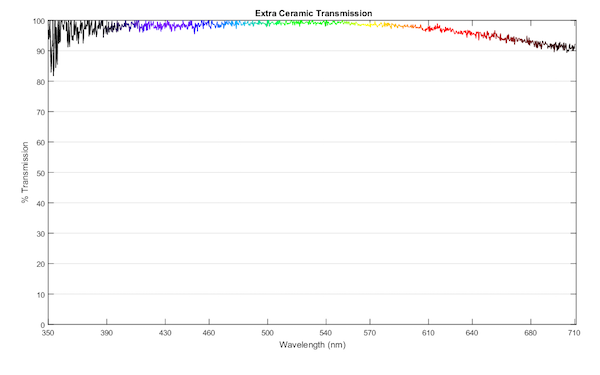 Schott has an on-line filter calculator at https://www.pgo-online.com/intl/schott-filter-calculation/schott-color-glass-filter-calculator.html which can output the total transmittance spectrum (taking into account reflections) or internal transmittance spectrum (discounting the effect of reflections) for any of the glass types they make for use in filters. One can also set the desired thickness of the glass. The simulations are for just the glass with no coating. You can try GG395 and 1 mm thickness as representative of a typical UV filter. GG420 looks very much like Zeiss UV T*.